What a great personalized ornament to give your special horse lover! 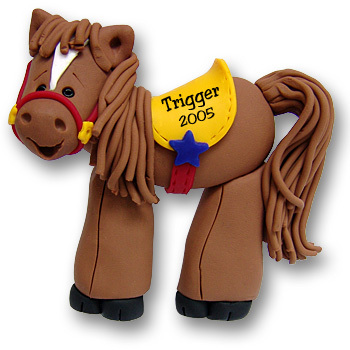 This cute little brown horse is great for any horse lover or fan of "Country Western" music or just western in general. It is handmade from polymer clay and is designed by Debi Allison. Personalization is also hand done. We do a very good job on personalizing but because it is done by hand it cannot be perfect.